Accidents happen. When you buy an expensive appliance, you would think that if you had an accident with it, replacement parts would be available. But not so for the Oster “New Horizons” coffee maker, available exclusively at Canadian Tire. I used to love shopping at Canadian Tire. I grew up on buying Canadian Tire merchandise for hardware – hand tools, auto parts, power tools, and other general merchandise. My grandfather would take me shopping there as a child, and I learned from him about the amazing value of “Canadian Tire money,” and how if you saved it up, you could get some pretty great stuff. However, over the years, I think they have tried to become more like the “big box” stores, and in doing so, have lost a lot of what they once were. Twenty years ago and more, service at Canadian Tire was awesome. Staff were knowledgeable, and there was always someone around. It seemed that every department had an expert who could wisely guide you with your purchases in that department. I’m not sure what happened over the years, but recently, the Canadian Tire stores I’ve been in just don’t seem to have that level of expertise or even staffing anymore. And now, I have another beef with Canadian Tire and the Oster company. About six to eight weeks ago, I purchased the Oster New Horizons coffee maker, pictured above, at Canadian Tire. Seemed to be a great deal as it was on sale at 50% off, and I needed a new coffee maker. For the most part, I really enjoyed the coffee maker. For my tastes, it made suitable coffee especially with the “strong brew” setting. The LCD screen was a bit hard to read for my eyes, but I really didn’t need to read it very often. I just wanted good coffee. I likely would not have bought the coffee maker at its full price of $129.99, but on sale for around $60.00, it seemed like a great choice over the ones that were just a bit less expensive. Now I regret that decision. I didn’t pay attention to where the coffee maker was, opened a cupboard door, and knocked the coffee maker onto the floor. A big mess to clean up – hot coffee, hot coffee grounds, mixed with the broken shards of glass that was once the coffee decanter. I’m sure many of you have had a similar experience; they always happen at the worse times, right? Just when you badly need that coffee, before you are planning on running out the door to a meeting. But now you have a big mess to clean up, before you’ve even been able to get a shot of caffeine into your bloodstream and rushing to help rid the brain fog after waking up. The mess gets cleaned up with half a roll of paper towels being used, and after putting on footwear to protect your feet from sharp glass shards, tiny and large, on the floor. You sweep the floor a dozen times to make sure you’ve got every piece of glass up. Then, your mind goes to getting a replacement decanter. Should be easy enough, you’d think. 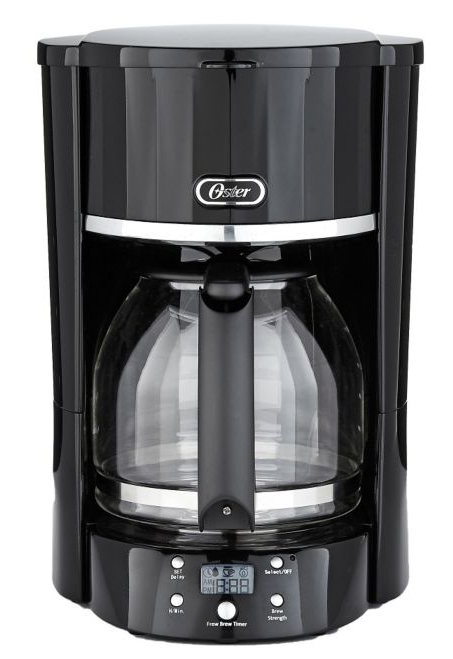 It took three emails with Oster’s customer service to learn that there is no spare decanter available for the Oster New Horizons coffee maker! No – it’s an exclusive Canadian Tire product and as a result, you just can’t replace a broken one. The part or service that you need may be obtained by one of our Authorized Service Centers. This coffee maker is a Canadian Tire exclusive and we do not have no part or part number for this model. The decanter is not available at this time for this new model, and we have no information when this part will be available. Full price of this coffee maker is about $130.00 but no spare decanters are available? Breaking the decanter was a pretty expensive accident! I was willing to pay a small price of a new decanter so I could continue making coffee in my 130 dollar coffee maker – but basically, the thing is a $130.00 piece of junk now. Kind of disappointing for something you’ve owned for only a few weeks. I guess the big lesson here is to be careful of what you purchase at any store really – make sure there are spare parts available, and don’t assume you’ll be able to get it fixed if you happen to have an accident. For a kitchen appliance that sells for $130.00, that seems a bit outrageous that you would have to check on that before you buy. I’ll certainly be cautious of any future purchases at Canadian Tire, especially those that have the Oster name on them. You might want to be careful as well.